Happy Friday! 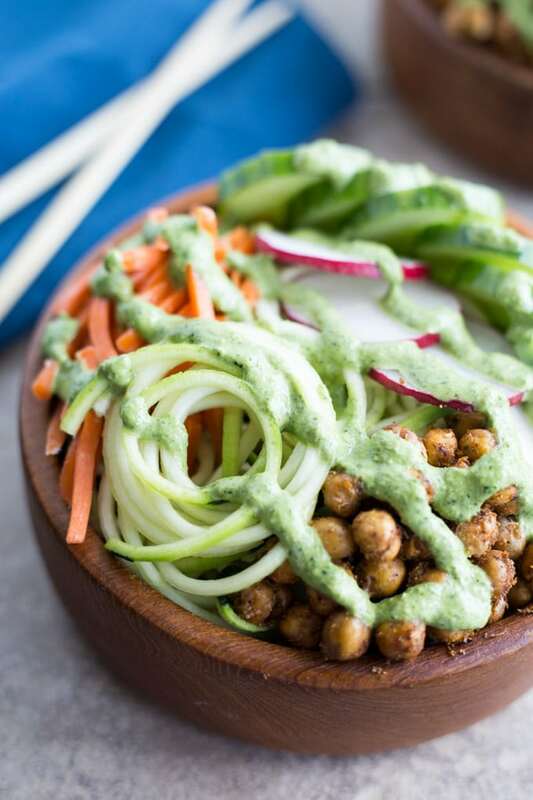 It’s been a while since I posted a recipe, so let’s jump right into these Zucchini Noodle Bowls with Crispy Chick Peas and Jalapeño Dressing. This is one of the easiest meals I’ve made this summer! I’ve had this recipe in my back pocket since the beginning of summer, but I was waiting for zucchini season to be in full swing before I shared it. And it’s definitely in full swing now. Have you been taking advantage of all the fresh produce at your local farmer’s market? Zucchini, cucumber, tomatoes, greens, herbs, carrots, radishes…… the selection of fresh veggies is awesome this time of year! 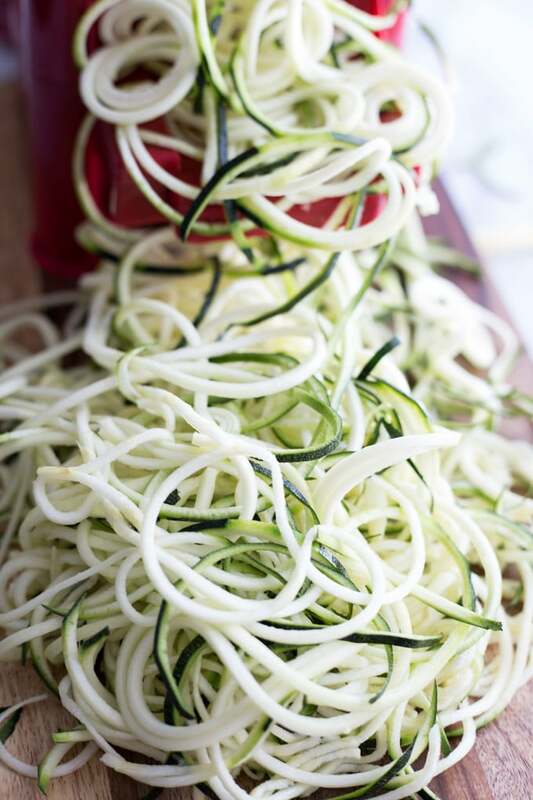 While I cook with zucchini year round, they are so much fresher this time of year, and their larger size is perfect for spiralizing! (If you’re not aware of spiralizing or my love of zucchini noodles, you should read this post for Turkey and Prosciutto Zucchini Bake 😉 . I actually had this recipe post ready to go earlier this week, but decided to put it on hold and re-shoot my photos after attending a Pinch of Yum Tasty Food Photography Workshop in Minnesota. If you haven’t heard of Pinch of Yum, it’s a popular food blog authored by Lindsay Ostrom, who also happens to be a talented food photographer. She occasionally teaches workshops in her Minneapolis studio, so when the opportunity came up to register for one, I jumped at the chance. It was an awesome learning experience and I picked up a lot of great photography tips and tricks (and met some lovely people along the way). But when I returned home last weekend, I knew I had to re-shoot the photos for these colourful Zucchini Noodle Bowls. My previous photos just didn’t do the bowls justice! So, hear I am, finally sharing this recipe for Zucchini Noodle Bowls! This recipe is super quick and easy, and makes a tasty clean eating lunch or side dish. Totally perfect for meal prepping Sunday! 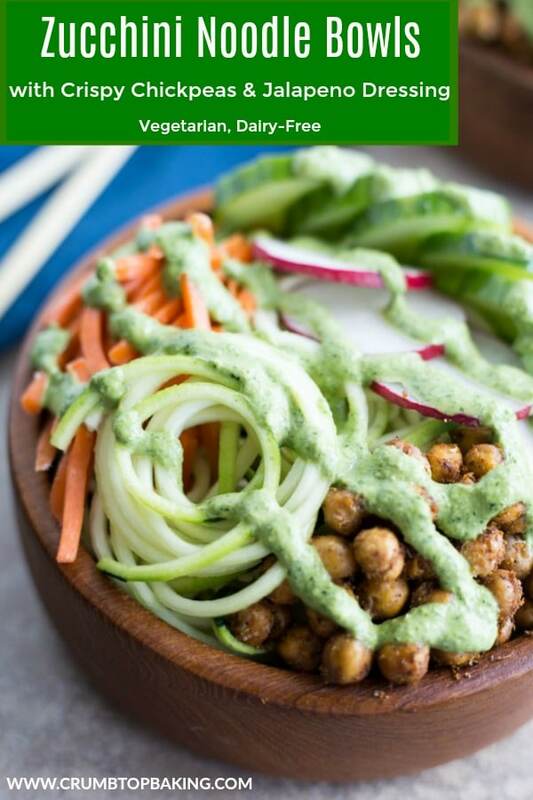 Just spiralize the zucchini (the bigger the better), chop some veggies (use whatever you have on hand), roast the chick peas (or buy a bag of crispy chick peas) and make the jalapeño dressing (this is a must!). And done! You are now ready to assemble these delicious bowls! The magic in these bowls is definitely the jalapeño dressing. Please don’t be frightened off by the jalapeños! This is not a hot and spicy noodle bowl. While the chick peas and the jalapeño dressing may have a bit of kick to them on their own, when mixed in with the veggies, the flavours really balance out. The dressing also has fresh parsley, spinach, tahini, garlic and lime juice, so the jalapeño flavour is definitely subtle in this mixture. And, can you tell from the photos how the thick and creamy dressing just sticks to the noodles? I’ve been adding this dressing to all my salads lately. It’s addictive 🙂 . And this recipe makes about a cup, so it goes a long way! If you make this recipe, be sure to let me know in the comments below or take a photo and tag Crumb Top Baking on Instagram. I would love to see some of your creative takes on this recipe! 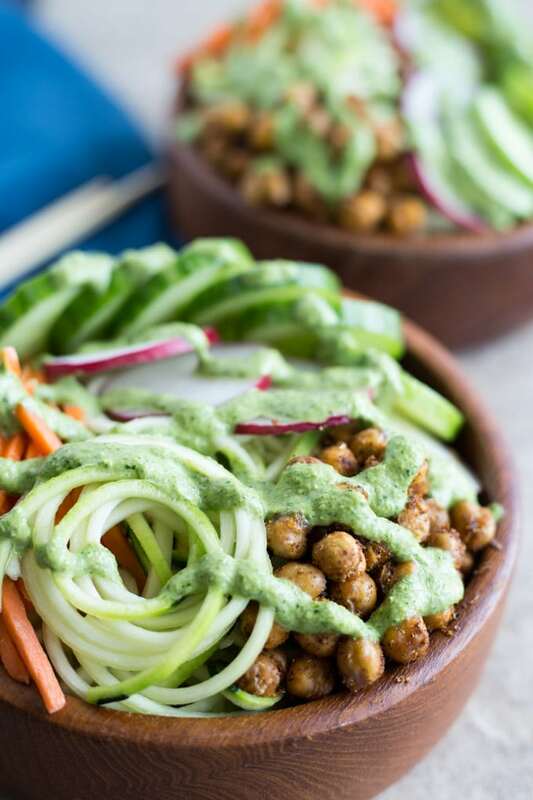 These Zucchini Noodle Bowls with Crispy Chick Peas and Jalapeño Dressing are loaded with fresh veggies and plant-based protein. Perfect for a healthy lunch or side dish. And don’t skimp on the jalapeño dressing. It’s creamy, clean eating goodness! Chick Peas: Pre-heat oven to 425 degrees. Drain and rinse the chick peas. Pat dry, add to a medium-sized bowl and coat with olive oil. In a small bowl, combine all the spices and salt. Add to the chick peas and toss to coat. Spread the chick peas out on a parchment paper covered baking sheet and bake for 30-40 minutes, or until crispy. Stir the chick peas every 10 minutes to ensure they don’t burn. 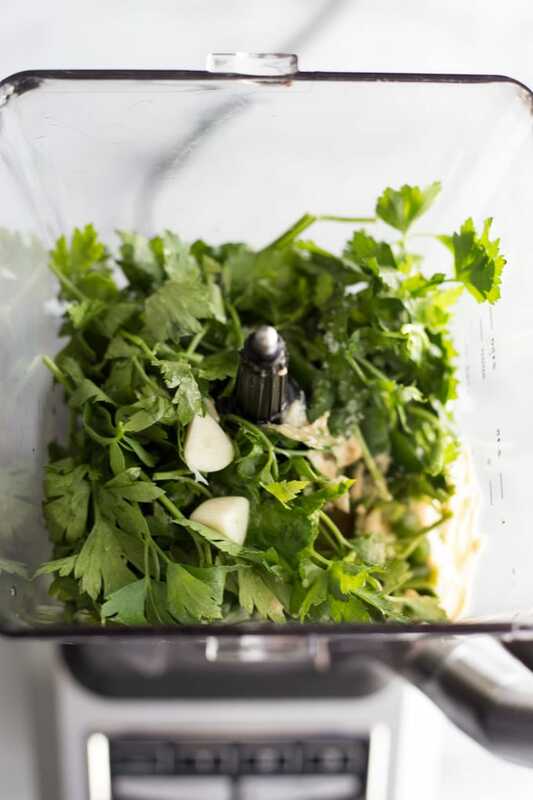 Jalapeño Dressing: Add all the ingredients to a blender and blend on high until thick and creamy. 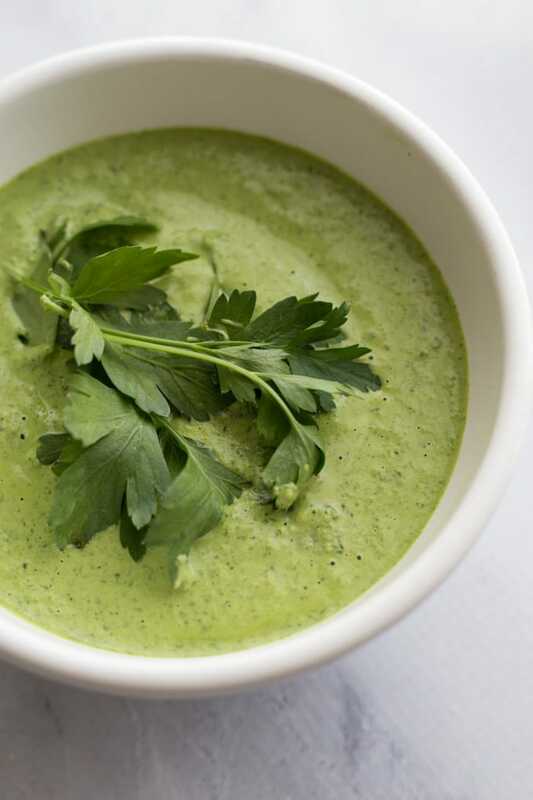 The dressing will also thicken up in the refrigerator. 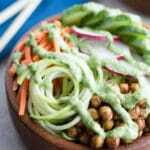 Zucchini Noodle Bowl: Add the spiralized zucchini and veggies to four small bowls and top with chick peas and jalapeño dressing. The chick peas are best straight out of the oven when they are hot and crispy. If you are making this recipe ahead of time or have leftovers, store the chick peas separately in a container on the counter. They will lose some of their crunchiness, but will still be delicious. If you really like crunchy chick peas, you can also buy seasoned snack bags of chick peas at the grocery store. These Zucchini Noodle Bowls are served cold (except for the chick peas), so the noodles and veggies have a really nice crunch to them. Thanks Maria! I hope you like it! I’ll be dropping by your backyard this summer for some zucchini! Your jalapeño dressing is amazing! A perfect way to dress up zoodles! Thanks Elaine! The jalapeño dressing adds a nice kick to the zoodles!! Thanks Nicole! This bowl makes me long for summer too! And the creamy jalapeño dressing is definitely my favourite part! Take care! Isn’t Zucchini so good when it’s fresh, in season in the summer? This salad looks delicious and I LOVE the sound of that jalapeño dressing. Thanks Natalie! Totally agree. I buy zucchini year round, but nothing beats the in-season zucchini from the farmers market! Take care! I love this and can’t wait for summer when I have zucchini and jalapenos in my garden. I’m always trying to find new ways to use them, and this bowl is perfect!